Connect your camera with the communication device using Wi-Fi. Connection methods will differ depending on the communication device operating system and model. 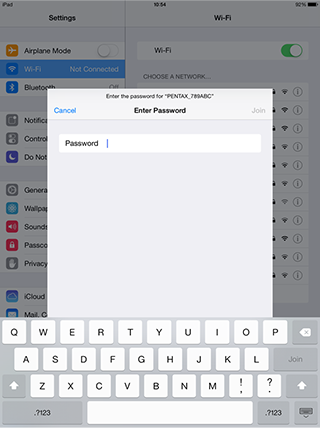 Set the wireless LAN (Wi-Fi) function to ON in the communication device settings. The [Choose a Device] screen appears on the communication device. *1 Depending on the OS version, when ImageSync is launched, a message may be displayed asking you to grant access to the SD card. If access is not granted, the gallery viewer function and transfer function are disabled. *2 Depending on the OS version, after selecting the camera, a message may be displayed asking you to grant access to the location information. 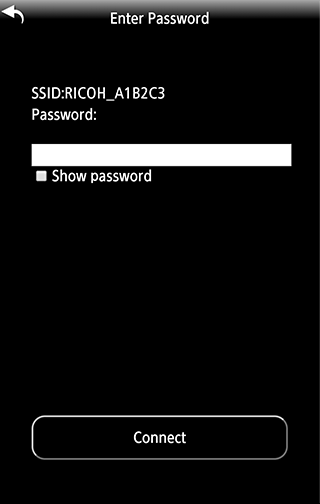 If access is not granted, the SSID list cannot be obtained and connection from ImageSync is disabled. 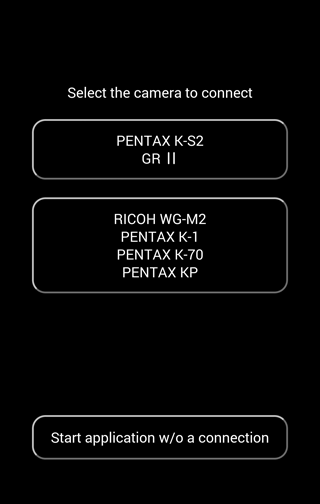 In the [Network List], tap the camera SSID. Enter the password, and tap [Connect]. * The password can be displayed on the camera LCD. Methods differ depending on cameras, therefore please refer to your camera’s instruction manual. Communication device View Mode is displayed. • Auto Power Off is not available while a Wi-Fi connection is established or images are being transferred. 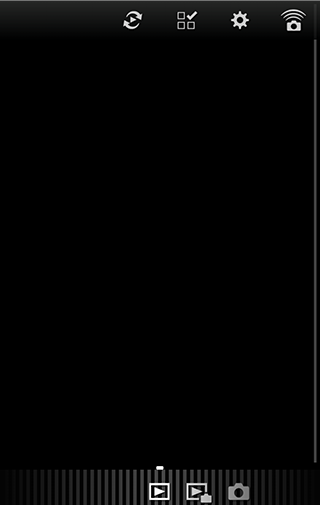 If Auto Power Off is activated while a connection is not established, the Wi-Fi function is disabled. The function is enabled when the camera recovers from Auto Power Off. • The Wi-Fi function is disabled during the USB connection or while outputting image data. • Do not attempt to use the Wi-Fi function in a location where the use of wireless LAN devices is restricted or prohibited, such as on airplanes. • When using the Wi-Fi function, observe local laws and regulations governing radio communication. • If a memory card with a built-in wireless LAN function (such as an Eye-Fi card or a Flucard) is used, radio wave interference may occur. When this occurs, disable the Wi-Fi function of the camera. 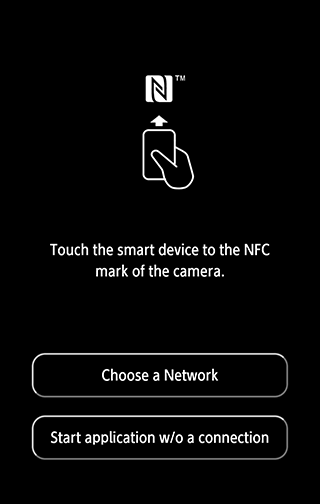 If using a communication device that has an NFC reader/writer function, then lightly touch the camera’s NFC mark with the device’s NFC mark. If the device does not have an NFC reader/writer function, then tap [Choose a Network]. * If using the NFC reader/writer function, then set the NFC reader/writer function to ON in the device. * For NFC touch connection, connection may take several tens of seconds. * This screen is not displayed for NFC touch. 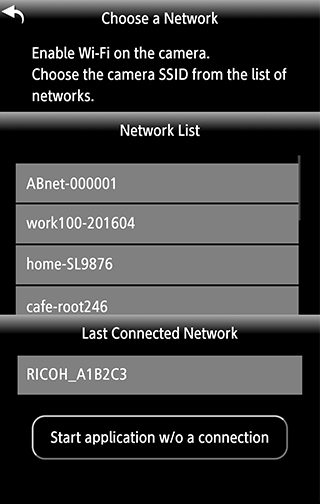 From the list of detected networks, tap the camera's SSID. 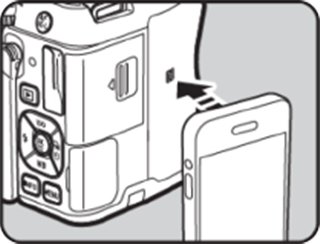 A Wi-Fi connection is established between the communication device and camera. Communications device View Mode is displayed.